Bringing clean lines of modernity to any kitchen, the Caple CE1101 110cm ceiling extractor is not only stylish but incredibly powerful. Depending on which motor you select the CE1101 has an extraction rate of up to 1570m³ per hour, yet is designed to be quiet. 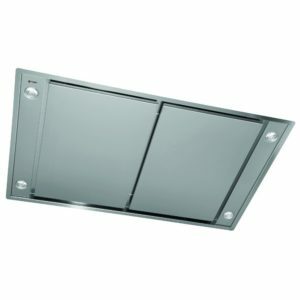 Arriving in sleek stainless steel this ceiling extractor will be a perfect fit for any kitchen. 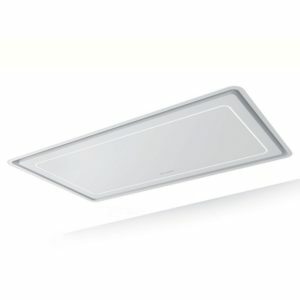 Say hello to the first "slimline" ceiling hood. This revolutionary design from Air Uno can fit accross the joists as well as between them, saving you the hassle and the cost of building a bulkhead. Finished in white glass and stainless steel this will look stunning in any kitchen. Boasting LED lighting and an extraction rate of 766m³ per hour it's a great option to complete your kitchen. 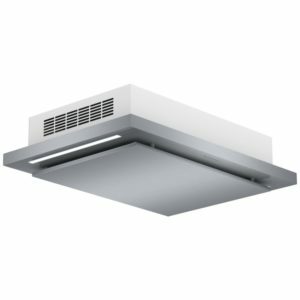 This built in ceiling extractor from Elica is 100cm wide, finished in stainless steel with a white light panel and has an extraction rate of up to 770m³ per hour. It is designed for ducted extraction but can be converted to recirculate with a recirculation kit, and features a rotatable motor enabling a choice of 5 ducting outlets. 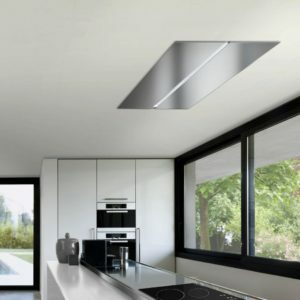 This built in ceiling extractor from Miele is 110cm wide and finished in stainless steel. It boasts an extraction rate of up to 1200m³ per hour depending on the motor you select. Looking for something a little less intrusive? The 90cm Faber Heaven Glass SLIM ceiling hood boasts a maximum extraction rate of 705m³ per hour and an impressive 72dB maximum noise level. At 90cm wide it's ideal for sitting above a large built in hob or above an island unit. It features a reduced height motor to aid installation within confined ceiling spaces. 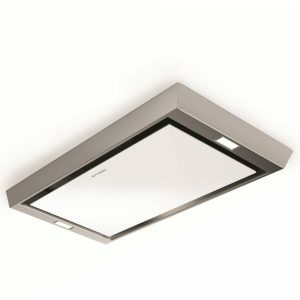 This built in ceiling extractor from Elica is 100cm wide, finished in stainless steel with 2 LED strip lights and has an extraction rate of up to 770m³ per hour. It is designed for ducted extraction but can be converted to recirculate with a recirculation kit, and features a rotatable motor enabling a choice of 5 ducting outlets. 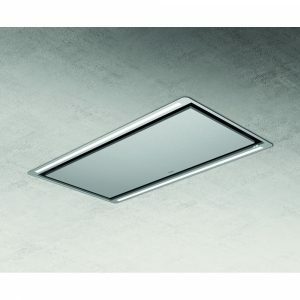 This stylish ceiling hood offers powerful performance with modern, unobtrusive design. With three speeds plus an intensive mode it makes short work of removing steam and aroma. Boasting an extraction rate of 575m³/hour, LED lighting and filter saturation indicators there's plenty to talk about! There are soft touch control buttons, and a remote control when you are out of arms reach as well. Designed to be ducted out for maximum efficiency, this model can be used in recirculation mode through the use of a recirculation kit. 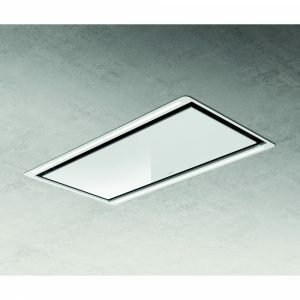 This stunning Salieri ceiling hood from Air Uno looks outstanding; sleek and minimal design is an oustanding focal point with its modern stainless steel finish and LED strip. Fitted over an island unit or cooking station it will make light work of the most lingering cooking odours, particularly with a superb maximum extraction rate of 820m³ per hour. Looking for something a little less intrusive? 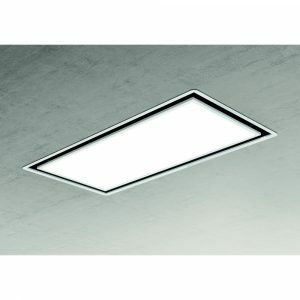 The 121cm Faber High-Light ceiling hood boasts a maximum extraction rate of 710m³ per hour and an impressive 71dB maximum noise level. At 121cm wide it's ideal for sitting above a large built in hob or above an island unit. It features a compact motor to aid installation within confined ceiling spaces. 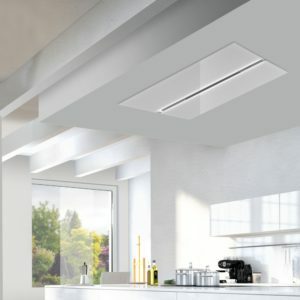 This built in ceiling extractor from Elica is 100cm wide, finished in white with 2 LED strip lights and has an extraction rate of up to 770m³ per hour. It is designed for ducted extraction but can be converted to recirculate with a recirculation kit, and features a rotatable motor enabling a choice of 5 ducting outlets. 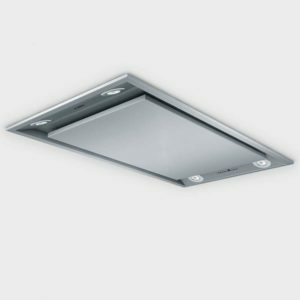 This built in ceiling hood from Bosch offers fantastic extraction, with rates of upto 850m³/hour with great style. Offering sleek and simple lines so you get all of the performance with none of the fuss, there are three speed settings plus an intensive mode and brilliant LED lighting for when you want to keep an eye on your cooking. Finished in stunning white glass, this sleek and stylish Salieri ceiling hood from Air Uno makes a superb focal point in your kitchen. With bright LED strip lighting, you can easily check on your cooking, if there's more steam then just select one of four speed settings using the remote control up to a maximum extraction rate of 820m³ per hour. With this much power it will clear the air in no time! Looking for something a little less intrusive? 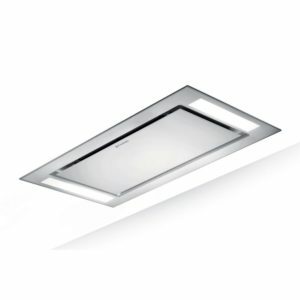 The 91cm Faber High-Light ceiling hood boasts a maximum extraction rate of 710m³ per hour and an impressive 71dB maximum noise level. At 91cm wide it's ideal for sitting above a large built in hob or above an island unit. It features a compact motor to aid installation within confined ceiling spaces. 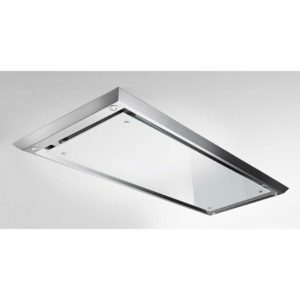 The 90cm Faber Heaven Compact ceiling hood has been specially designed to be easy to install. 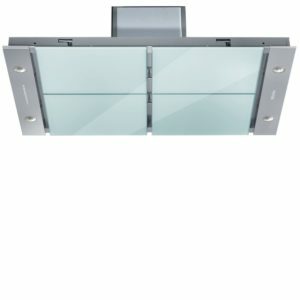 The compact motor design and slim hood body allow this sleek stainless steel and white glass ceiling mounted cooker hood to be installed between ceiling joists, eliminating the need for a bulkhead. The Heaven Compact is remote control operated and has a maximum extraction rate of 640m³ per hour with a maximum noise output of 70db when used on the intensive speed.